Spain has been given high marks in the annual global democracy index released earlier this month by The Economist, placing 19th out of 165 countries ranked for the quality of their democracies in five categories: electoral process and pluralism; civil liberties; the functioning of government; political participation; and political culture. 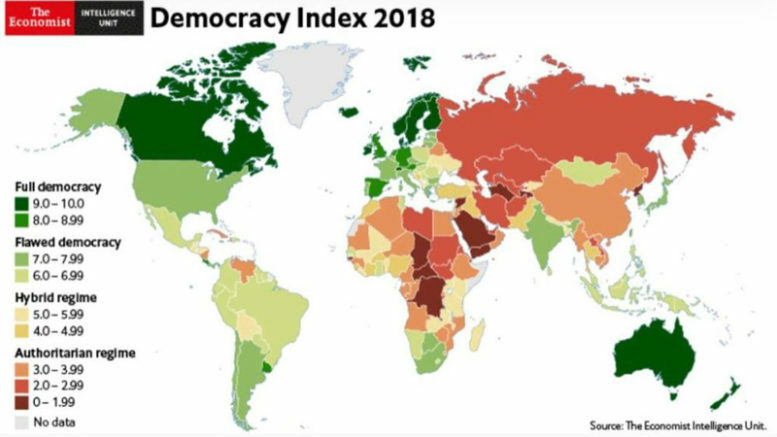 Using 60 indicators within these categories, The Economist Intelligence Unit (EIU) research division scored all the countries and ranked them on the basis of their scores within five categories ranging from “full democracy” to “authoritarian regime”. Scoring 8.08 out of 10, Spain was ranked among only 20 countries worldwide that the EIU says merit the classification of full democracy. According to the EIU index, the quality of Spanish democracy outranks several other EU member countries, incuding France, Belgium, Italy and Portugal. 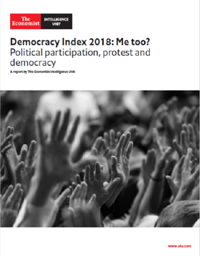 The UK is ranked at 14th place in the 2018 EIU index, while the United States is ranked at 25th worldwide, falling short of the EIU’s definition of a “full democracy”. The ten most democratic countries in the world today are Norway, Iceland, Sweden, New Zealand, Denmark, Canada, Ireland, Finland, Australia and Switzerland, according to the EIU index. At the low end of the ranking are Russia and China, which the index classifies as “authoritarian” states.